As we strive to maintain our position in the Southern League pyramid we need to continually to improve our facilities, not only to maintain our position but to also create a facility for the youngsters from the community of Swindon to enjoy. We often hear of the promises that there’s plans to replace the playing fields and pitches in Swindon which have been lost to new housing or industrial estates but ‘promises mean nothing until they are fulfilled’. At Swindon Supermarine we took the initiative and acquired our own freehold land, measuring around 9.5 acres, and we have set our sights on continually improving our Webbswood Stadium. We have scope to develop our facilities in a number of areas but there is always a need to finance this along with the day to day running of the club. We have always been encouraged by the fantastic support already given to us by our sponsors but we need more help to move forward and five seasons ago we provided another fund raising activity with our ‘£1 Match Predictor Quiz’ that we will operate once again during the 2018/19 season. To participate in the Match Predictor Quiz you can obtain a ticket from an official of the club or contact us to participate online. 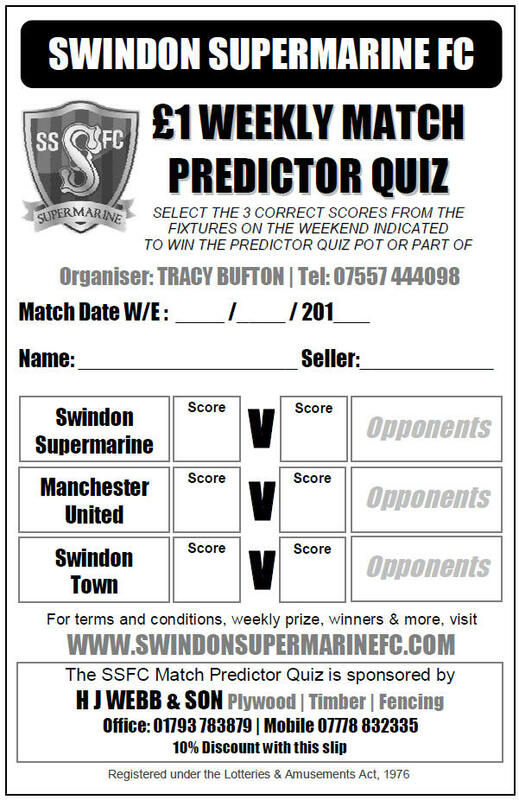 On each ticket you must predict what the actual score will be in the three matches involving Swindon Supermarine, Manchester United, Swindon Town and their opponents on the weekend you purchase a ticket. You keep a counter foil of your predictions so you can then follow and check your predictions to see if you have won. You can then contact us if you do have the correct scores, but we will inform you within 24 hours of the last match played if you have won! Each weekend £50 (known as the Match Predictor Quiz Pot) will be paid to the person or persons who predict the three correct scores. If more than one person predicts the correct scores then the Match Predictor Quiz Pot will be shared equally. If no one has the correct scores the Match Predictor Pot will be carried over to the following week and will accumulate until someone does predict the correct scores and wins the Match Predictor Quiz Pot. If one of the three teams isn’t playing then the Match Predictor will be decided over the remaining two matches. If two or three teams are not playing then the Match Predictor will not take place that weekend and any money in the Match Predictor Quiz Pot will be carried over to the following weekend. If the predictor is declared void on a particular weekend the participants from that week can either have a refund or a free entry the following week.